Bags On Board Refill Rainbow Poop Bags fit any Bags On Board dispenser. 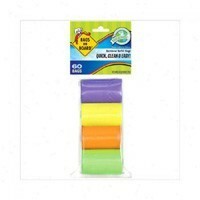 They are quick and easy to useÂ and come in 4 funky shades. The bags are of a sturdy design and have a leak proof guarantee. 4 x 15 bag rolls.